Reading his biography, one could probably rationalize why Robert Indiana had a reputation for being somewhat unpleasant. He was adopted, he had transient parents who later divorced, and was repeatedly taken advantage of, which includes the copyright debacle of LOVE, as well as the requests for art and more late into his life (speculation). A photograph sent to me, thought to have been passing through New Castle in 2002 on his way to Indianapolis to commemorate the Indiana Obelisk at the Indiana State Museum with then Governor Frank O’Bannon. He was an enigma and a recluse. So many people had tried to reach out to him after his permanent move to Vinalhaven, Maine, and without much success. The late John Dickey shared a note he had received from the artist when we showed a small exhibit of serigraphs at the Henry County Art Center, which was a rarity. I remember being floored looking back at that visit to the Star of Hope that he had a binder marked “Henry County Indiana,” which I regretfully did not ask to peruse. I can only imagine it was filled with his unreturned collection of correspondence from other community members and articles of interest. Bob receives a ceramic, illuminating Courthouse from the Henry County Historical Society. First contact: a package arrives at the New Castle, Indiana post office with the return address of The Star of Hope. Surely, HOPE is something Bob carried with him throughout his life. But that leads me to a word I think he embodied even more…RESILIENCE. Although that word can’t be made into a masterpiece as easily, to come from the beginnings from which he came, to endure the trials and tribulations he endured, it beyond question took resilience. Had he not exemplified that word, the world would be a little less colorful, a little more devoid of HOPE, and a little less full of LOVE. May his legacy of love, hope, and resilience live on. The sun sets below Carver’s Pond behind The Star of Hope. This whole pursuit to reacquaint Robert Indiana with his birthplace (and vice versa) has always been about making connections. His 1977 masterpiece of the Milwaukee Bucks’ MECCA floor (which I wrote about in May 2016) has been one of the more interesting ones. Growing up in New Castle, Indiana, basketball became a huge part of my life. It’s rare to move on into adulthood not being able to swish a free throw or nail a three-pointer from the corner. Reading more about the MECCA floor on my flight home from Vinalhaven, I reached out to the men who owned the floor finding it for sale on a reclaimed wood site. That connection to Ben Koller has stayed active and we’re always looking for ways to reconnect with “Bob” and incorporate him into everything we’re doing for his legacy. Although he doesn’t respond, he’s aware of the wheels turning and that’s important to me. Enter my childhood neighbor who could also sink free throws, Adam Hamby. Now living in southern Indiana, he has combined his hobby of woodworking (learned from his father, Ron) and his love of basketball to recreate basketball floors. Starting in 1995 by creating the New Castle Fieldhouse as they were laying the new parquet floor over the tartan floor, he now creates these great pieces for collectors and enthusiasts alike through his business venture, Land of Mini Basketball Courts. Building his repertoire of works, he asked if I’d be interested in a recreation of the MECCA floor. Of course, I said yes, and now am looking for a home in the community for it. With the redevelopment of the old National Guard Armory at Grand Avenue and South 15th Street (Robert Indiana Parkway), it may very well end up there with a plaque about its history and the connection we share (don’t forget, New Castle boy, Kent Benson, also played on this floor). Stay tuned to see where to look for this awesome piece and check out Land of Mini Basketball Courts to see if Adam can recreate your favorite court! About four years ago, when this journey began, there were few who knew who Robert Indiana is, never mind the fact that he was born here in New Castle, Indiana. In our small town of 18,000 people, all to be shown to honor this artist was a 6″ by 6″ representation of LOVE in the middle of a 20-foot mural in the historic Henry County Courthouse. Now, I write this post as a magnificent 8′ by 8′ LOVE sculpture sits in front of the progressing armory building, at the corner of Grand Avenue and South 15th Street (honorarily named Robert Indiana Parkway). This beautiful sculpture has deep meaning. Not only did its original creator take his first breath of life in this community, but this particular sculpture was fabricated by community students. I’m not sure they fully understand the magnitude of their work. I’m excited for them to see the community pride that their project provides grow over the coming years. Undoubtedly, this would not have been possible without the great welding instructing at the New Castle Career Center from their teacher, Steven Vitatoe, who not only taught them skills, but lessons in using them to give back to the community. 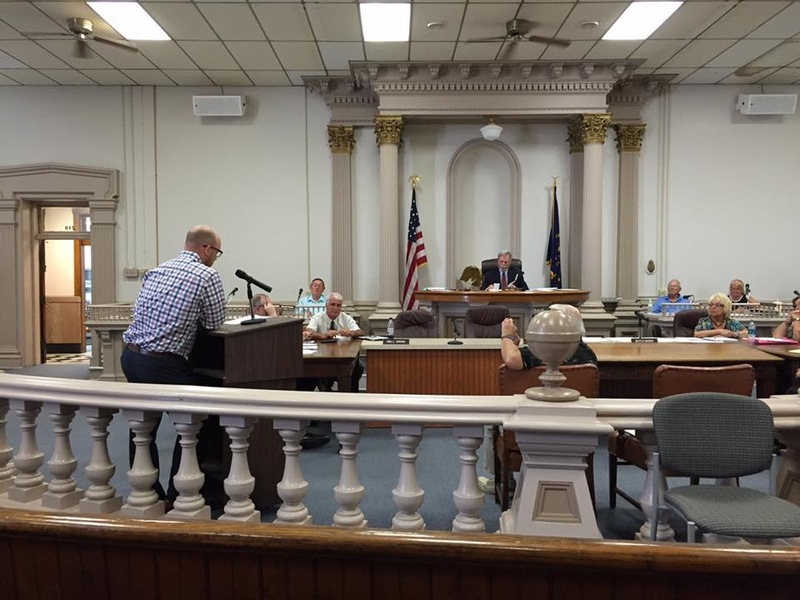 Carrie Barrett, director of New Castle Main Street, teamed up with Mr. Vitatoe to plan and provide for the project. Mrs. Barrett has continued to push for the Robert Indiana Arts & Culture District, which is a great honor to Indiana’s legacy, and also will be instrumental in the continued progress and development of the New Castle community. They both have worked tirelessly to bring our town something to be proud of and represent our dreams. The legacy of Robert Indiana is growing into what it should’ve been 60-some years ago. My HOPE is that he feels the LOVE his “long ago hometown” has for him. For more pictures of the installation, click here. To the man who has continually inspired LOVE all over the world, and who has encouraged a much needed spirit of positivity in the hometown we share….Happy 88th Birthday! Thank you Mr. Bouslog and Henry County Council for allowing me to come today to present an award, on behalf of the State of Indiana, to a man who cannot travel outside of his home, but is very deserving of this honor. Today, the community of New Castle-Henry County continues to build a bridge, no matter how tardy, to honor a creative mind, an iconic artist, and a noble son. Born on September 13, 1928, Robert Clark would quickly be taken from his birthplace of New Castle, Indiana. But throughout his extraordinary life, he continued to embody our community’s core values, like heritage and resilience. New Castle-Henry County undoubtedly holds its heritage close. From the echos of basketball gymnasiums, to the hallways of the birthplace of another great innovator, Wilbur Wright. From the downtown streets of incredible buildings, including the home of Civil War General William Groce, to the pages of Ross Lockridge, Jr.’s great novel, Raintree County. Robert Indiana never forgot who he was or where he came from as he worked toward THE AMERICAN DREAM. This is evident in his works as he recounted his family’s heritage, included symbols of his youth, and referenced his ambitious journey as one of the world’s most notorious artists. Resilience. Growing up in a difficult time in our country, Robert Indiana’s family, like so many today, faced hardships. His father lost his job. He was very ill as an adolescent. His family was torn apart through divorce. He lived in 21 different homes before he was 17 years old, which is something unfortunately our youth today can relate to. However, he has experienced many moments of HOPE. His first grade teacher in Mooresville, Indiana encouraged him to become an artist. He graduated as valedictorian of Arsenal Tech High School in Indianapolis, where he focused on his art classes. He surrounded himself with encouraging artists who were on similar journeys. Just as our community has done time and time again, Robert Indiana has pushed forward with resilience in the face of adversity. Mr. Indiana now lives 1,074 miles away on Vinalhaven, Maine, where he has lived since November of 1976. However, where you’re born is a significant part of your journey, where you breathe in that first breath of life. We are fortunate to share that special connection with Robert Indiana, a man who set out to leave his mark on the world. It is imperative that we honor him here in his “long ago hometown” and continue to grow his legacy. That legacy includes not only his iconic works of art, but also his very embodiment of heritage and resilience. 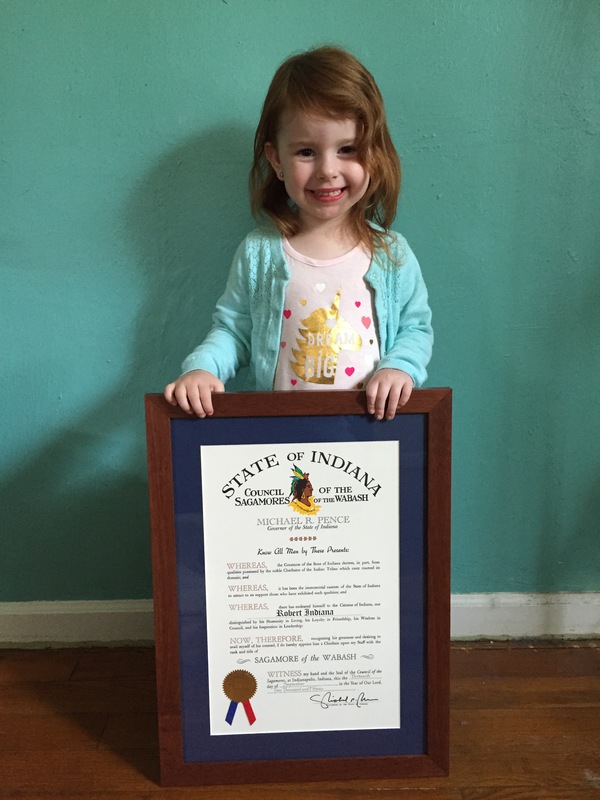 The Sagamore of the Wabash is an award given to significant individuals who have contributed greatly to Hoosier heritage. Its recipients include astronauts, entertainers, ambassadors, politicians, and athletes. Robert Indiana, an art icon who changed his name to reflect, remember, and embrace his Hoosier heritage, is well-deserving of this award. You can watch video of the presentation, from the historic Henry County Courthouse (New Castle, Indiana), by clicking here. Details are still being ironed out, but this summer we will be honoring our Sagamore. Thanks to Scott at Frost Framing for the beautiful matting and framing. Incredibly tardy, but finally took a package to the post office I have been meaning to since returning from our trip. I put this book that has meant so much to our community and written by Ross Lockridge, Jr., whose mother grew up in Henry “Raintree” County. The book was the topic of discussion when we visited Mr. Indiana. He wondered what we were doing to honor Mr. Lockridge, and we were pleased to tell him that we just dedicated a plaque on the lawn of the Courthouse in his honor and as a historical marker for the story. Later on in the week during our trip, we had visited the splendid little Vinalhaven Public Library, complete with its LOVE print and bronze LOVE sculpture. Mr. Bouslog and I had noticed that they did not have a copy of Raintree County. So was born this idea. My dad finally found a copy of the book, but it was in poor condition. Mrs. York, the mayor’s wife, had seen me with it, heard what I was doing with it, and offered to trade me copies. I appreciate this gesture, as her’s was much nicer. Almost 9 months ago, I was on a trek to meet a man who took his first breath of life in my hometown of New Castle, Indiana. I grew up knowing little to nothing about this man and all he had contributed to the world, which troubled me. So I set out to build a bridge. My friend (and former elementary school principal), Richard Bouslog, traveled with me to Vinalhaven last summer to meet Mr. Robert Indiana and to take him some affects of the “home” we all shared commonalities with. Some of these items were the front page of the local Courier Times newspaper from September 13, 1928 (when he was born), some books about New Castle, a proclamation naming our South 15th Street in his honor as Robert Indiana Parkway (a sign was sent later), and a ceramic Henry County Courthouse. That courthouse led to discussion about one of Mr. Indiana’s interests in which our courthouse is depicted, the book Raintree County, written by another creative genius from our community, Ross Lockridge, Jr. We talked about how there is now a plaque honoring Mr. Lockridge, Jr.’s masterpiece and the connection it has to New Castle, Henry County. We noticed your library did not have a copy of this book, and thought it would be a great way to connect our communities, and also honor both great men who left our little town to go on and do things that would change the world. I hope you will accept this gift and make it a part of your collection. I look forward to visiting your beautiful library again in the near future! 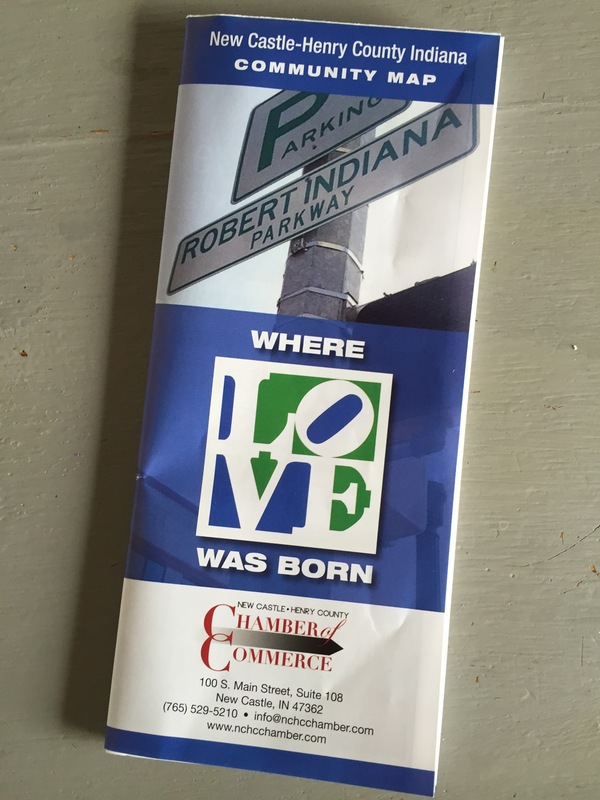 *More to come soon on this journey, including news from the Statehouse, as well as developments to the Robert Indiana Arts & Culture District! New Castle has come a long way in recognizing one of its favorite sons! 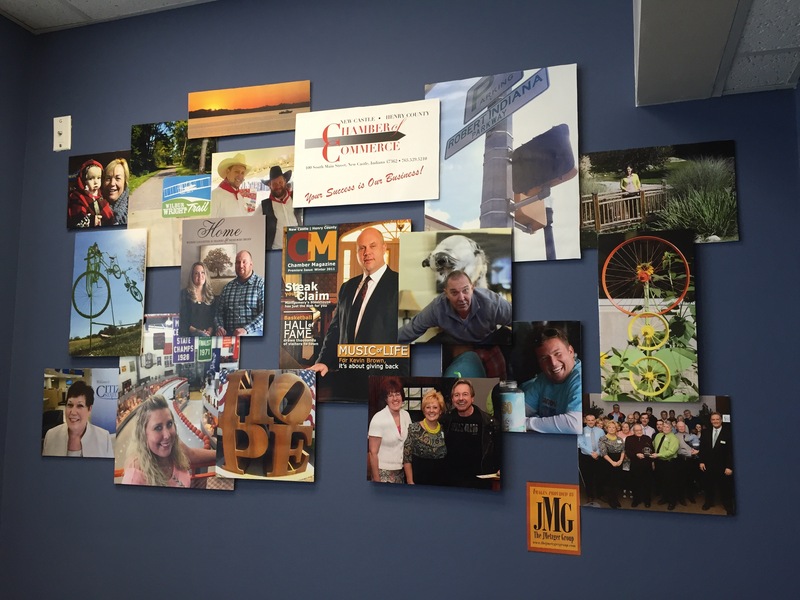 Thanks to the Chamber of Commerce for paying tribute in their beautiful collage and community map.